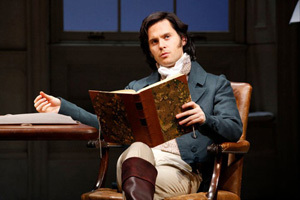 Arcadia, Tom Stoppard’s “dazzling masterpiece” (The Daily Telegraph), returned to New York for a limited engagement in an acclaimed production directed by five-time Tony Award nominee David Leveaux. April 1809, an elegant English country estate… Thomasina, a gifted pupil, proposes a startling theory well beyond her comprehension. All around her, the adults, including her tutor Septimus, are preoccupied with secret desires, illicit passions and professional rivalries. Two hundred years later, academic adversaries Hannah and Bernard are piecing together puzzling clues, curiously recalling those events of 1809 in their quest for an elusive truth. Arcadia featured an exquisite cast including Margaret Colin, Billy Crudup, Raúl Esparza, Glenn Fleshler, Grace Gummer, Edward James Hyland, Byron Jennings, Bel Powley, Tom Riley, Noah Robbins, David Turner and Lia Williams. ...And Mr. Riley (like Ms. Williams and Ms. Powley, from the British stage) is superb as the bright young man who is not Lord Byron (nor was he meant to be) but who recognizes — and bows before — real genius. New York Times.